I started writing a review of this scope back in early 2014 after receiving this telescope in January. Now, in January 2015, I see these scopes are no longer available new. I actually wound up returning mine due to optical defects. (Kudos to Astronomics for their customer support.) Based on my experience, and the experiences of others at the time, there seemed to be production issues with the lenses that lead to horrible inconsistencies in performance from one unit to another. Given these production and QC issues, I’m happy to see these scopes are no longer available new. It’s also quite sad, given that the good examples of this model produced really great results. There are however some very good alternatives to consider that I’ll discuss below. If you are considering a used AT65EDQ, there certainly are some good ones out there, just be careful to look out for distorted (pinched, triangular, or elongated) stars. Update: As of May 2015, it looks like there is a new batch of these telescopes become available. If you buy one, please leave a comment about your experience. I’d be very curious to hear if the new run addresses any of the quality control issues. So what’s wrong with this scope? Pinched optics to start. The 4th field flattener element of the scope is a highly elongated lens that is screwed in between two metal rings. There is no felting or other padding present, and if the ring is too tight, the element gets pinched, resulting in triangular shaped stars. This can also become a problem on cold nights, as the scope cools, the ring tightened on the lens element, causing this issue. I consider this a design flaw with the scope, since it seemingly can’t be operated in warm and cold conditions without specific adjustment for the temperature, which requires removing the focuser, and trying to get the tensions on the flattener retaining ring just right for the conditions. The second issue I encountered was with the objective lens cell itself. Despite my best effort with the scope, I always would up with egg shaped stars. This was what eventually lead to the return of the scope. Probably this could be fixed by collimation of the 3-lens element, but that’s certainly not something I have the equipment to attempt. In short, these were great scopes saddled with a design issue and some quality control problems; both of which should have been resolvable by the manufacturer. The $599 price point of the AT65EDQ f 6.5 is certainly the most attractive aspect of it. There aren’t many other short (less than f 7) 3-element APOs on the market for a similar price point, and none I’m aware of that include a built-in field flattener for less than $900. Stellarvue makes a new 60mm that is an f 5.5 for $599, but the field flattener is an additional $295. The best alternatives are the 80mm scopes from William Optics , Meade, and Stellarvue. Williams Optics also has a newer 71mm 5-element f 4.9 astrograph for just under $1000. There is also this William Optics Zenithstar 71mm Doublet with 0.8x FFR on eBay for $658! In my case, I opted for a Stellervue 80mm APO and their 0.8x field flattener-reducer that makes the f 6 scope into a flat-field f 4.8 imaging scope. I’ll share a review on that scope in the future. 3 Responses to "Astro-Tech 65 ED Quadruplet Astrograph"
I own an AT106LE triplet F/6.5 w/one FPL53 glass element. It is amazing in every regard and came with a QC sheet w/everything but a Strehl test chart. It splits the Double Double at ridiculously low power w any accurate ep such as a Televue Plossl. It is an amazing scope to test eyepieces and really shows what each ep is doing. It also cools down in a hurry. With a proper set of wratten filters to tame the bright objects, it really performs. I often blurt out like a teenager, No Way! (am I seeing this!?). Only problem with this scope is that I no longer enjoy reading all the new scope reviews, as I don’t need one. I’ve been doing Star Trails for over two years now (no scope involved), but one day I will image w the AT106. I just can’t give up the eyepiece; it is too much fun to just view while my cameras work away on their tasks. I haven’t had an astro-tech refractor, but I have a reflector that has messed up optics too. It seems AT has a big problem with quality control. 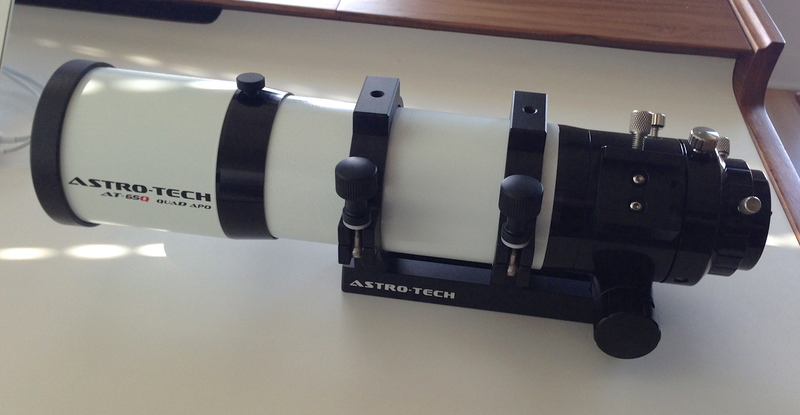 The AstroTech AT72ED refractor is also an option. It does need a field flattener (the AT-2), but this results in excellent images and (given good autoguiding) nice round stars.